For its fourteenth year running, the two-hour Puppy Bowl will air on Animal Planet beginning at 3 p.m. Eastern Standard Time on Superbowl Sunday, February 4, 2018. 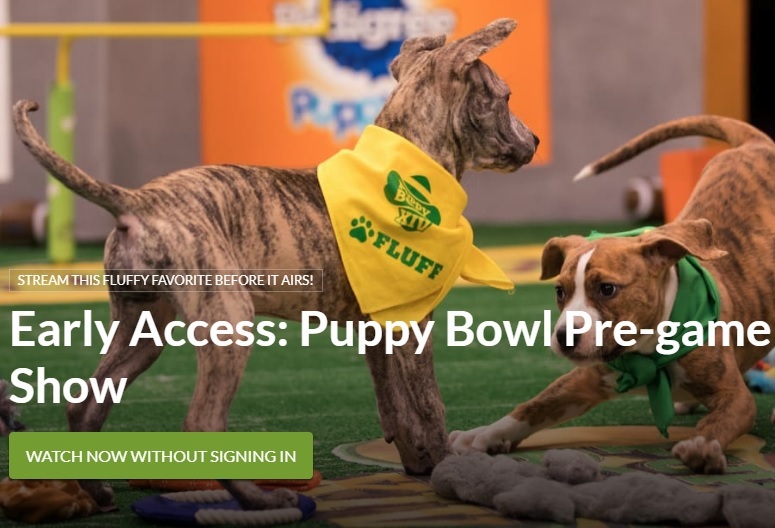 Digital viewers can point their paws to AnimalPlanet.com/PuppyBowl to stream Puppy Bowl 2018 online with a cable subscription login. The Puppy Bowl 2018 website also has several features and pre-game videos that do not require a cable subscription. To watch the 2018 Puppy Bowl online for free, sign up for a free trial on PlayStation Vue, DirectTV Now, or Sling TV. The tail-gating starts with the PUPPY BOWL Pre-Game Show at 2PM ET/11AM PT, featuring aww-nalysis and cuddly commentary from sports anchor James Hound with Rodt Weiler and Sheena Inu serving as pregame show analysts. The competitive canines will conduct their pre-game rituals from the PUPPY BOWL locker room, which includes an all-new locker room webcam. For PUPPY BOWL XIV, Animal Planet worked with forty-eight different animal shelters and rescue organizations from twenty-five U.S. states and territories, to fill the rosters of #TeamRuff and #TeamFluff with 90 adoptable players for this puppy pile-up – the most puppies and shelters in puppy bowl history.